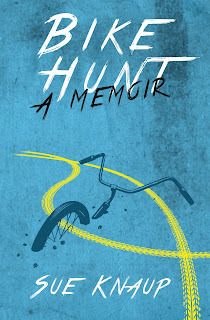 For the next in this series of excerpts from my recently published memoir, Bike Hunt, I’ve chosen the story of Jane’s giveaway. She was an immaculate, bright red mountain bike from the mid-1980s with all her original Suntour parts still shiny. I’d found her like a buried treasured at the bottom of a pile of department store bikes at the back of a thrift store in Seattle. Jane and I traveled by ferry to Victoria, British Columbia for two bicycle gatherings, and that’s where I gave her away to an enchanting green-eyed man. On my last morning after the conference in Victoria that followed the retreat, I walked out onto the sidewalk in front of the conference venue with Jane at my side. Jane deserved to find a home like her original owner must have given her, someone who would care for her and appreciate how special she was. I started down the wide, landscaped sidewalk, past caringly pruned young trees and flower boxes, benches and public art. I’d never seen such an adorned city, designed first for flowers and trees, a fitting place for Jane. The people I passed all seemed content and busy with their tasks. I’d only walked a few blocks when I spotted him, a somewhat overweight middle-aged man dressed in colorful rags, settled on a bench, his dreadlocks bundled under a billowing knitted cap of yellow, red, and green. I stopped to figure out what he was doing. He was counting change in his palm. With careful steps I approached, trying not to startle him in his vulnerable task. I stopped again about ten feet away and waited, watching his dark finger as it moved each coin to the edge of his palm. The finger froze on a silver coin and he looked up, his brilliant green eyes electrifying me. “I need to find someone who needs a bike, who can take care of this bike, who...” my emotion got the better of me. “Can you start again? I’m not quite sure what you’re getting at,” he said in a soothing voice. “Would you like this bike?” I blurted. “I would love that bike,” he said with conviction. “I can see she’s a beauty,” he said as he studied her. I could only smile in response because I couldn’t find any words. As I stood there, captivated by his green, determined eyes, I wondered what that might be. All my reference points had been replaced with what I believed Thunderhead needed. I let his words be the last between us, nodded with appreciation, and left him and Jane together on that majestic street. Jane’s Bike Hunt story is one of many throughout the book. I’ve got my eye on several more to share on this blog. All will have the label “Bike Hunt” so you can easily find them.